Volvo FM12 vs. Fuso FV54J. 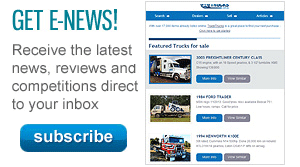 These two tippers are vehicles from either end of the spectrum of cabover rigs on offer in the Australian market. The tipper market has very particular needs in terms of truck specification and trucks have to be able to handle the heaviest possible loads economically. There is also a traditional preference for conventionals in this market and the cabover’s normal length advantage is less important when speccing tippers. 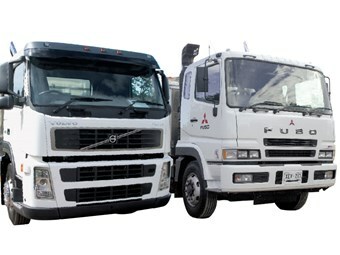 The Fuso FV54J is quite a basic offering with just over 400 horsepower on tap whereas the Volvo FM12 has a 460hp engine and is a sophisticated modern truck. The FV uses the 405hp Fuso engine that produces 1765Nm (1303 ft lb) of torque at 1,200 rpm. The Volvo uses the 460hp D12D engine that puts out 2,200Nm (1,624 ft lb) at 1,050 to 1,400 rpm. The gearbox in the Fuso is the 18-speed Roadranger with a clutch brake control on the gearstick. Fuso is still not fitting a clutch with a clutch brake control on the pedal. As gear linkages go the Fuso does quite well for a cabover, coming close to the responsiveness of the UD’s linkage tested last year. The Volvo cable linkage works well and is a vast improvement on other cable linkages of the past. This model is fitted with the manual 14-speed box as the automated I-Shift is only rated up to 45 tonnes and this tipper is capable of running at over 50 tonnes GCM with a quad dog. The Geartronic auto would be an option from Volvo but is not really suited to the kind of work that a tipper is expected to handle. 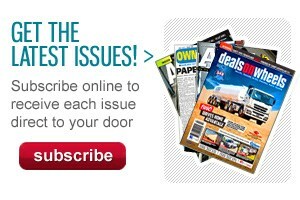 Geartronic’s forte is out on line haul routes at high masses. This is further illustration of the need for Volvo to upgrade the smooth I-Shift for higher GCMs. In many tipper applications the Roadranger is the only gearbox used, so for drivers coming out of the standard American truck the Volvo box is going to feel sluggish and awkward. It is, in fact, a good gearbox but can be hard to get used to after too many years with the Eaton box. Improvement over some other tippers driven, but in comparison directly to the Volvo there can only be one winner. Volvo has developed sound deadening to a fine art and enhance the feeling of comfort in their cabs with low noise levels. In the FM12 the only noise to be heard is the sound of the wind whipping around the sun visor. The FV is fitted with a good simple CD radio above an LCD screen for the automatic climate control system fitted. Climate control in this truck is a real luxury. It took a long time in the Fuso to find the cruise control, finally found at the central engine cover behind the gear stick. This is also where all of the controls for tipping the truck and trailer are placed. Once cruise is turned on it is controlled from a stalk to the right of the steering column. All over the engine cover are a series of storage options — two large boxes plus pocket for odds and ends, with a drinks holder that opens up next to the gear stick. Above the windsreen there is more storage and a set of lights for both driver and passenger, plus a large cab light. In the Volvo cab as tested the engine cover was clean but any tipper operator would probably fit some sort of document box to keep the odds and ends that are needed around town on this kind of work. Overhead there are two substantial lockers and behind the seats there is plenty of room for gear as there is in the Fuso. One of the advantages of the storage in the Volvo is that there are also two outside lockers on either side of the cab. The passenger seat is a double seat but would struggle to seat two adults in comfort for long. The amount of space behind the seats is substantial. A couple of times in traffic, this driver had to make a sharp stop and because the steering wheel is small it is very easy to hit the horn button as the driver grabs the wheel and the foot hits the brake. 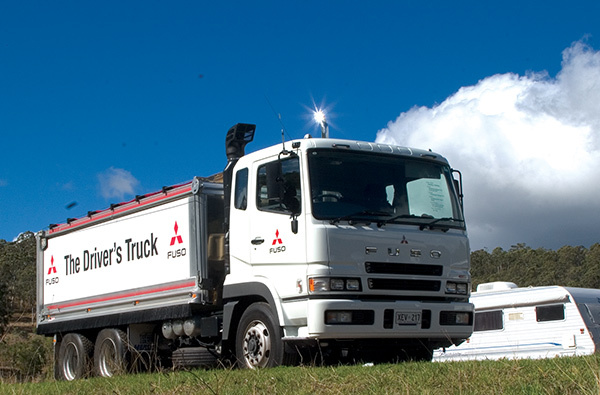 The taller differentials used by Fuso mean that the truck is very comfortable at 100 kilometres per hour. The Volvo uses shorter diffs and is running at just under 1,800 rpm at 100km/h. Climbing up Cunningham Gap and the Fuso feels quite good dropping down to seventh low and pulling up the hill at 1,650 rpm at just under 60km/h. The truck feels like it is performing well within its capabilities and is comfortable at this speed. 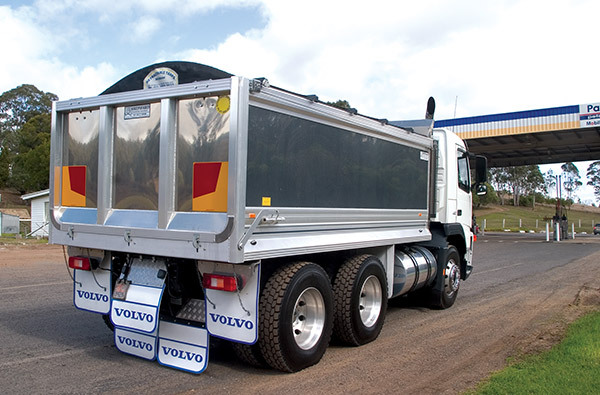 On the Volvo the gear of choice is sixth low and running at 1,300 rpm to keep the truck going at 60km/h. Running an engine like this at 1,300 rpm demonstrates just how more there is left in the locker in terms of performance from this engine. A drop down into fifth brought the revs up to 1,600 and gave the truck even more to spare on the steeper pinches but the road speed remained the same. The better performance of the engine is shown in the surprisingly quick eight minutes the truck took to make the climb. The Volvo had climbed the grade at speed and without any apparent effort. The Volvo took a creditable eight minutes and 39 seconds, managing to stay in seventh gear all the way to the top. But the truck was baulked at the summit by a very slow B-Double, making a drop into the bottom box necessary. Descending back down the grade the engine brake on the Fuso holds well in seventh low gear. Travelling at over 50km/h and running out through 1,700 rpm, the retardation kicks in and holds the truck back well. Volvo’s engine brake is reliable and effective and it was possible to descend in fifth high at 1,300 rpm and the trucks holds speed at about 50km/h. Again there is more performance available if required but the truck is very simple and safe to drive at 50 to 55km/h without touching pedals. Between the two the actual difference in speed is only relatively small both up and down the grade. 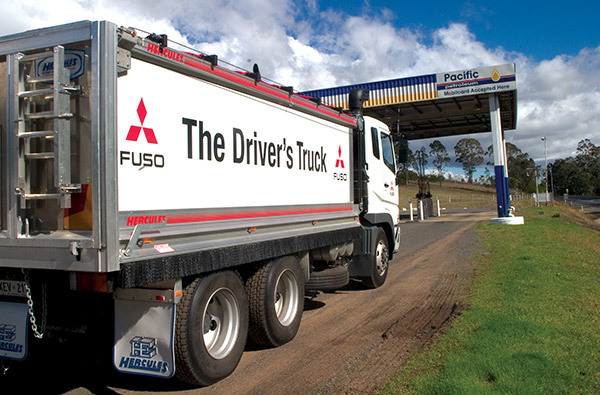 The real difference is how easy it is for the driver and the driveline on the Volvo compared to the Fuso, which is working hard and needs the driver’s full attention. Fully loaded the Fuso’s short wheel base seems to induce a rocking motion that is made uncomfortable by the inadequate springing on the driver’s seat. This discomfort is added to by the fact the seat belt is fixed to the B pillar and does not move with the up and down motion of the seat. The driver could probably live with the ride from the suspension if the seat was of a higher spec. The actual seating position and access to the steering wheel and controls is quite good in both trucks but the Volvo wins out on comfort. There is enough torque available from the Fuso engine to enable the truck to keep the momentum going quite nicely on Kessels Road as the stop-start traffic rolls up and down hills from one traffic light to the next. This feels like quite a torquey little engine. It is the same out on the open road where it is easy to keep up with cars while travelling through rolling country. On the odometer check the Fuso proved to be the most accurate of any of the Japanese trucks tested along this stretch of road. It was just about spot on in logging a kilometre. Volvo trucks consistently read exactly right each kilometre in every test ATN has done. The rear view mirrors are effective in both trucks and, because they also have relatively low cab heights, it is possible to get a view all around the truck. The Volvo’s visibility is impaired by the sheer size of its mirrors and their casings. On the Fuso the mounting is skinny and the square mirrors are unadorned. The mirrors on the Volvo fill up the whole of the front quarter of the passenger side window and at some junctions it takes quite a bit of head weaving to get a clear idea of what’s coming. At the end of the day both trucks performed well. With both engines over 400hp and running at under 25 tonnes GVM, they are performing well within themselves. This may explain the similarity in things like the climb and descent timings and speed. If the trucks were running with dog trailer and at full weight it’s likely the Volvo’s higher and flatter topped torque curve would come into its own, helping the truck hold onto gears and accelerate better than the Fuso. 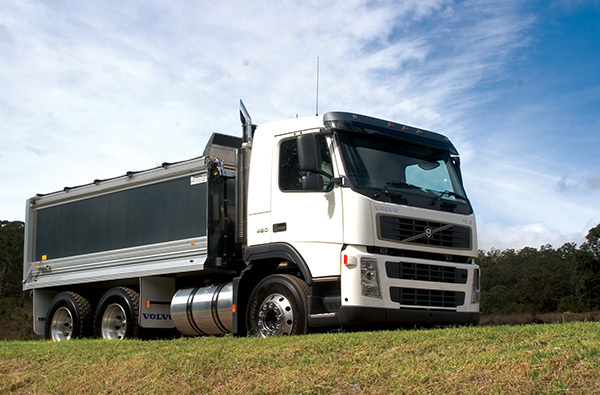 The Volvo’s comfort levels are at the top end of the range while the Fuso is a lot more basic. This is likely to be reflected in the comparative price of the two. In these terms the Fuso would probably suit an operation making short runs around town when the driver is in and out of the cab all day. The Volvo’s ride would come into its own on longer runs where the driver spends long hours in the cab between drops. As happens in many of these comparison tests there is no clear winner between the two. But the exercise serves to emphasise the different applications that each particular truck is suited to. Transmission: 18 spd Roadranger Man.